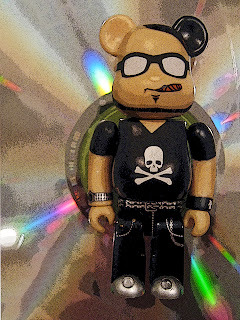 The Be@rbrick on the right is a lookalike of Tomoyuki Tanaka (a.k.a. the Fantastic Plastic Machine), the hot & hip Japanese DJ who is a proponent of the Shibuya-Kei sound, a variety of Japanese pop music that combines bossa nova, lounge/house music with 60s movie soundtracks. His music has been featured in movies like 'Austin Powers: The Spy Who Shagged Me', in albums of other famous DJs like Stephane Pompougnac (Hotel Costes), and in TV commercials created by artist Takashi Murakami for Louis Vuitton. 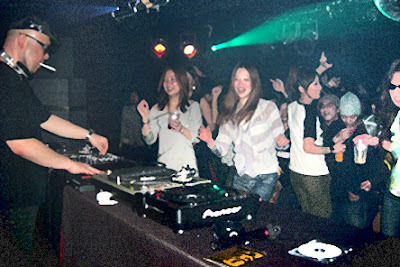 Club DJs like Tanaka (below, at a Tokyo club) are movers of the night life and shakers of the dance floor. Like puppets, people sway, gyrate, hop, wave, bump and grind to their groove. Thanks, Moataz! :-) Drop by again soon!